Once again, we are offering area high school seniors a chance at $10,000 in educational scholarships. Our essay competition engages and challenges students from Marinette and Menominee Counties to learn and write about mining-related topics. Over the years, we’ve awarded nearly $50,000 in scholarships to area students. What role do minerals play in our national defense? Mining for Tomorrow Scholarship – Eight (8) $1,000 scholarships will be awarded to students with the highest ranked essays. Clifford D. Nelson Memorial Scholarship – One (1) $2,000 scholarship is available for a student that will be attending Michigan Technological University and majoring in a mining-related field, including Applied Geophysics, Geology, Geological Engineering, Mining, and Mining Engineering. To qualify for the scholarship, students must be graduating from high school in Marinette or Menominee Counties in 2019. Home-schooled students are eligible to participate. Applicants must provide proof of admission in an undergraduate college or vocational program in 2019. Submissions will be judged on writing style, content, grammar, originality, clarity, conciseness, articulation, and organization. Each student who submits a winning essay will receive an educational scholarship. There will be nine scholarships available — for a total of $10,000 in scholarship awards. The selected essay winners will be contacted directly by Back Forty Mine. Winners to be formally announced during the senior awards assembly at their high school. To complete the application and enter your essay, click here. If you have any questions, please call (906) 753-9602 or email info@backfortymine.com. Let's take a look at the Mining Life Cycle. Ever wonder how mining operations work? A typical project goes through a series of different phases which we refer to as the mining life cycle, each presenting unique challenges and opportunities. Click on the categories below for a description of each phase. In Michigan, all metallic mineral exploration and development activities on state and private property are regulated by the DEQ, including leasing and drilling. A metallic mineral lease within itself does not give a company permission to mine. If a deposit is found, separate applications and approvals will be required before mining activity can take place. It can take years or even decades to discover a viable deposit. Geologists utilize aerial surveys, soil analysis, and drilling to determine if there is a sufficient mineral deposit to justify mining. Many factors control the economic viability of a deposit, but the most important are the grade, size, location, and demand. Exploration does mean a mine is going to be developed. Detailed studies (e.g., feasibility study) are conducted to determine the capital requirements, community context, permitting requirements, critical environmental challenges, and other information vital in moving the project to the next step. If the outcomes yield positive results, additional research and planning will take place at a more granular level. As more information is gathered, companies gain a far greater understanding of mine plans, facility layouts, infrastructure, and environmental and social impact assessments. All nonferrous metallic mines in Michigan are required to submit the necessary permit applications with the DEQ Office of Oil, Gas, and Minerals. The permits typically include mine, water discharge, and air. Government agencies thoroughly review each permit application and gather public input before issuing a permit. Each permit comes with conditions that must be met before, during, and after mining occurs. While these permits are a requirement for all mines, the exact details and specifications are unique for each project. Upon receipt of permit approvals and capital investment, the project can prepare for development. Hundreds of workers will build the infrastructure required to support the operation. Examples include roads, water treatment plants, maintenance facilities, warehouses, contact water basins, and process plants. Construction of such sites is a massive undertaking and boost to the local economy. A typical project can take 15 to 20 years between discovery and construction. See what the Back Forty Mine will look post-construction here. Mining involves extracting large amounts of rock from below the Earth’s surface. The goal is to separate the valuable minerals from the non-economical rock. To do this, overlying rock is blasted, and the material is placed in a truck and hauled to the surface. The material that contains valuable minerals (e.g., ore) is sent to the process plant, while the non-economical material (e.g., waste rock) is taken to the temporary waste rock facility. The waste rock will be used to backfill the pit once mining ends. In the process plant (e.g., mill) the zinc/copper/lead ore goes through a conventional process of crushing, grinding, and floatation to separate the minerals. The gold/silver ore needs a few more additional steps before the valuable minerals are captured. When mining ceases, the site is reclaimed, and land is returned to a state compatible with adjacent properties. Examples of reclamation activities include removal of all buildings and infrastructure, capping and vegetating the tailings facility, backfilling the mine with waste rock. Postclosure monitoring lasts for 20 years following completion and approval of reclamation. The time may be shorter if the DEQ determines monitoring and maintenance activities to preserve the integrity of the area are complete. The DEQ requires an annual mining and reclamation report filed each year with the agency. The reports are available to the public. 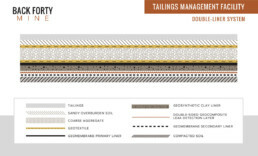 What are tailings and what is Back Forty’s management plan? We will process roughly 4,800 tonnes (5,300 tons) of ore per day onsite. We will use traditional crush-grind-float technology and equipment to separate zinc and gold from noneconomic rock. After removal of these valuable minerals, what remains is called tailings. Our tailings consist of particles of rock, water, and residual process chemicals (e.g., lime, copper sulfate, silica), and have the consistency of drywall mud. We will pump tailings to a double-lined tailings management facility (TMF). The TMF will cover a total footprint of 123 acres. During operation, the facility will be a maximum 118 ft tall, and after closure a maximum of 138 ft tall. Water management is crucial to our design. Unlike a conventional TMF, our design is neither a pond nor does it store liquid tailings. The entire base of the TMF will be compacted and double-lined, consisting of a composite primary liner and a single secondary liner separated by a leak detection system. This lining extends under the perimeter wall and the surrounding berm. The coarse aggregate above the primary liner collects the water (e.g., residual tailings water, runoff, rain, snow) and gravity directs it to an exterior sump. We will also pump water that collects on top of the TMF to the contact water basins or the mill for reuse in the milling process. As a protective measure, if we experience an extreme storm event, an emergency spillway will channel water from the TMF into the open pit. Once mining ends, the TMF will be capped and revegetated to prevent any oxygen penetration or water percolation into the facility. Also, we will dewater tailings after capping. By doing so, the TMF will be near neutral pH and will not require perpetual care or treatment. Our monitoring program includes more than a dozen ongoing studies, including water balance, groundwater level and quality, perimeter wall settlement, and leak detection system analysis. Also, an engineering review by a qualified independent Geotechnical Engineer will take place on an annual basis. The performance of the facility will be reviewed closely during construction, operations, and post-closure to ensure that the design intent is being satisfied, to confirm design assumptions, and to identify any modifications that may be required. 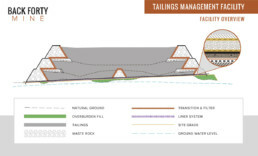 The design mitigates known risks of traditional tailings facility construction. Similar and successful models include the Malartic Mine and the Musselwhite Mine in Canada, and the Neves Corvo Mine in Portugal. Before construction commences, the DEQ will review and approve the plan. Thickening tailings to 70:30 ratio of solids-to-water compared to traditional 30:70 ratio of solids-to-water. Reducing water in tailings recycles approximately 793M gallons of water back into the milling process on an annual basis. An emergency spillway channels water from the TMF into the open pit in case of an extreme storm event. Incorporates modern technologies and mitigates known risks of traditional TMF construction. Dewatering promotes tailings consolidation, increases tailings density, and extends strength characteristics of TMF. The entire base rests above a double-liner with a leak detection system. A competent and free draining perimeter wall roughly 108 ft wide made out of waste rock. Dr. Tawni Hunt Ferrarini, a Professor of Economics, has published her findings from a series of focus groups that she hosted in 2018. The Mining and Community Focus Groups captured community members’ perspectives and opinions on the strengths, weaknesses, opportunities, and threats of mining in and around Menominee County. Dr. Ferrarini spoke with people from both ends of the mining debate, and who come from different economic, political, social, and cultural backgrounds. To read the Executive Summary Report, go to Dr. Ferrarini’s website. As I approach my first anniversary with Aquila Resources and my time in Menominee County, I can’t help but reflect on the many valuable conversations and engagements that have taken place. There is a desire to grow the economy in the community and the region. From past travels and experiences, I truly understand that this should not come at a cost to the community, the environment, and it certainly should not compromise our commitment to zero harm. We have secured the permits necessary to construct and operate the mine. As we move through the permit alignment process and initiate pre-construction activities, I encourage you to ask questions about issues you feel have not been satisfactorily addressed. I would also encourage you to ask your community leaders what more the presence of the operations can do to help build capacity and alternative growth opportunities within the community. On that note, I am pleased to announce two community partnering initiatives: one with the Menominee Conservation District to bring soils and groundwater along with geology and mining education into local classrooms, and another with Menominee & Marinette Area Community Foundation to establish Children’s Savings Accounts with students entering kindergarten in Menominee County. The M&M Area Community Foundation has already grown this initiative to include other financial institutions and businesses which will enable the program to extend to Marinette County. Our team’s commitment and dedication are integral to Back Forty’s success. I appreciate all their efforts and contributions, and I look forward to growing the team in the coming years. From all of us at the Back Forty Mine, have a Happy New Year. In November, we filed a mine permit amendment application with the Michigan Department of Environmental Quality (DEQ). Since the issuance of our original permit, we have refined elements of the design of Back Forty to align with the Feasibility Study and issued wetlands permit. Examples of the revisions in the amendment application include a reduction in wetland impact, improved dust management, increased water storage capacity, and reduced footprint of tailings facilities post-closure. We continuously look for opportunities to minimize the potential impacts of our operations on the environment and community. MDEQ will also accept written comments regarding the amendment application by mail or e-mail from the day of the meeting until 5:00 P.M. EST, Wednesday, February 6, 2019. Mail your comments to Back Forty Mining Permit Amendment, MDEQ-OGMD, 1504 West Washington Street, Marquette, MI 49855. E-mail your comments to the designated MDEQ mailbox at DEQ- Mining-Comments@michigan.gov, including "Back Forty Mining Permit Amendment" as the subject. The MDEQ will only consider comments that pertain to the Mining Permit Amendment Application prior to making a final decision. For additional information, contact Melanie Humphrey, MDEQ, Oil, Gas, and Minerals Division, 906-250-7564, or e-mail humphreym@michigan.gov. For more information about the meeting and amendment documents, click here. On December 19, the U.S. District Court for the Eastern District of Wisconsin dismissed the Menominee Indian Tribe’s federal lawsuit challenging EPA and U.S. Army Corps’ failure to exercise jurisdiction over Aquila’s wetland permit for the Back Forty Mine. The Court dismissed the two claims in the Tribe’s original complaint and rejected the Tribe’s motion to file an amended complaint that proposed two additional claims because the amendments would be pointless. The Court held that the Tribe could not challenge the federal government’s refusal to exercise jurisdiction over the state wetland permit under the Administrative Procedures Act or the Clean Water Act. In November, the Coalition to Save the Menominee River filed a complaint in federal court in Wisconsin. The Coalition’s claims are basically the same as those the U.S. District Court for the Eastern District of Wisconsin recently dismissed. There are two separate contested case hearings on the DEQ’s approval of the Back Forty mine and wetland permits. We are confident in our position and expect a favorable resolution in all current legal proceedings. Back Forty employees and Nadeau Township Volunteer Fire Department members John Dziedzic (left) and Noah Poupore (right) visit Carney-Nadeau School for Fire Prevention Week. The volunteer firemen spoke to classes from PreK to fifth grade about essential steps to reduce the likelihood of having a fire and how to escape safely in the event of one. We send out email updates on a regular basis to keep the community on top of our progress. If you would like to receive these updates, sign up at today. On December 19, the U.S. District Court for the Eastern District of Wisconsin dismissed the Menominee Indian Tribe’s federal lawsuit challenging EPA and U.S. Army Corps’ failure to exercise jurisdiction over Aquila’s wetland permit for the Back Forty Mine. The Court dismissed the two claims in the Tribe’s original complaint and rejected the Tribe’s motion to file an amended complaint that proposed two additional claims because the amendments would be pointless. The Court held that the Tribe could not challenge the federal government’s refusal to exercise jurisdiction over the state wetland permit under the Administrative Procedures Act or the Clean Water Act. Click here for Aquila's original press release. The DEQ issued our original mine permit in 2016. Since that time, we've refined elements of the mine design to be consistent with our feasibility study and previously issued wetland permit. Examples of the revisions in the amendment application include a reduction in wetland impact, improved dust management, increased water storage capacity, and reduced footprint of tailings facilities post-closure. We continuously look for opportunities to minimize the potential impacts of our operations on the environment and community. Permit amendment to reduce impacts on environment and community. The Michigan Department of Environmental Quality (DEQ) issued our original mine permit in 2016. Since that time, we've refined elements of the mine design, and we have identified measures to reduce the overall impact of the site. DEQ requires mining companies to apply for an amendment when a proposal is made to make changes to operations (e.g., mining, reclamation). The amendment is consistent with the feasibility study and the wetland permit that DEQ issued earlier this year. We will be sharing more information about the amendment shortly. In the meantime, you'll find a copy of the amendment at the library in Stephenson or online on the DEQ's website. Go to ftp://ftp.deq.state.mi.us/geowebface and click Mining, Back Forty Mine, and you'll see the amendment files at the bottom. The files are very large due to the amount of detail. The confusion over regulation arises because local governments often establish zoning and ordinance rules for their community. However, the law says explicitly that "a local unit of government shall not regulate or control mining or reclamation activities that are subject to this part, including construction, operation, closure, postclosure monitoring, reclamation, and remediation activities, and does not have jurisdiction concerning the issuance of permits for those activities." There is an exception for ordinances that do not duplicate, contradict, or conflict with Part 632. For example, local governments may enact regulations to enforce hours of operation and routes used by vehicles.